She was born with a head full of dark hair, not enough to do anything with but just enough to hold a small bow. I remember Allison occasionally, and unintentionally, wishing away the days of short hair so she could have enough to pull back, just enough to create a part or maybe enough for a small ponytail. The day came faster than we anticipated and Madison started sporting pigtails and ponytails, clips and barrettes of various size and color... then today happened. 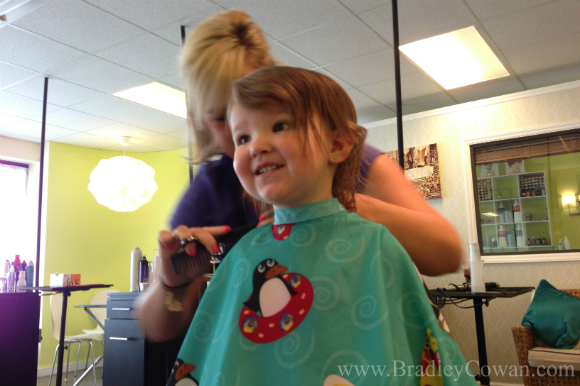 At two years old she was finally getting her first haircut. We attempted to prepare her for this event several days in advance by letting her know what to expect and even having a mock haircut so she would be familiar with the idea. On the way to the salon, we picked up a few blow pops in case of an emergency (a tactic we successfully used before when getting her ears pierced) although we didn't use or need them in the end. 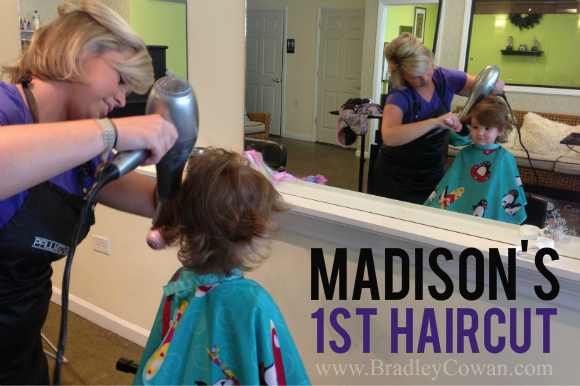 Madison sat there with patience beyond her years and soaked in every moment of this experience. Immediately reminding me how routine life becomes and how the mundane tasks of adulthood upkeep can simply fall into a category of the daily/weekly/monthly to-do lists; another item to quickly check off when the time presents itself. Yet for Madison, this was an event approached with pure excitement. 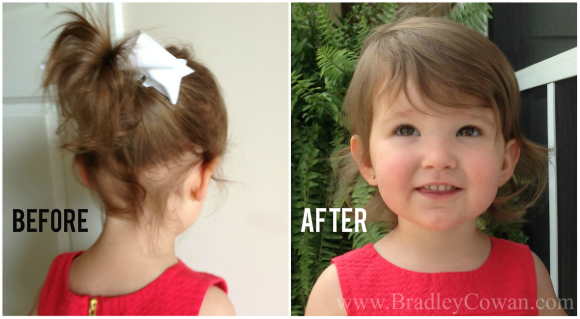 With the demeanor of a seasoned adult comfortable enough to accept the welcomed change scissors and a blow dryer can provide, it was her eyes that displayed the joy and innocent curiosity of a toddler. While this day is ultimately another milestone considered a first for her, I can't help but think of it as a last. The last few strands of baby hair that Allison collected in an envelope, those same strands we combed after bath time and stroked during feedings or tucked behind her ear when they were finally long enough to do so. The last time I'll see her sit in a salon chair staring at a reflection of intrigue and naivety waiting for the initial sound of cutting shears then watching a tiny curl tumble over itself before landing in what would become a small pile of toddler hair. With every first to absorb, there seems to be another last worth grasping onto a little longer... the circle of life, I suppose. My baby girl is transitioning into a little lady right before my eyes.